Beat the eggs, wine and orange flower water till fluffy but not dry. Add the sugar slowly while continuing to beat. Once well blended and dissolved, add 2 cups of flour gradually, continuing to beat. This will make a sticky dough. Put this into a loaf tin and bake in a moderate oven for about 15 minutes till the loaf is set and firm to the touch but not browned. Allow to cool. Slice thinly. Drop the oven temperature to 140 degrees. Lay the slices of cake on oven trays and put back in the oven for another 10-15 minutes until lightly browned. 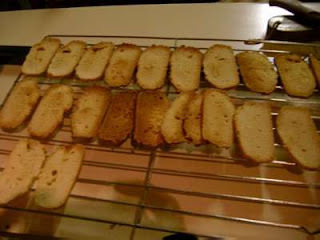 These strongly resemble modern biscotti minus almonds, and are crisp and light and would be great with coffee.